Why NCTO and Euratex Disagree on the Textile and Apparel Rules of Origin in T-TIP? In an April 13 press briefing, the National Council of Textile Organizations (NCTO) which represents the U.S. textile industry, insists the Trans-Atlantic Trade and Investment Partnership (T-TIP) shall adopt the so called “yarn-forward” Rules of origin (RoO). Yarn-forward (or “triple transformation”) in T-TIP means, in order to receive preferential duty treatment provided under the trade agreement, yarns used in textile production in general need to be sourced either from the US or EU. All 14 existing free trade agreements (FTA) in the United States adopt the yarn-forward RoO. In comparison, in its position paper released in June 2015, the European Apparel and Textile Confederation (Euratex), which represents the EU textile and apparel industry, favors a so called “fabric forward” RoO in T-TIP instead of “yarn-forward”. Fabric-forward (or “double transformation”) in T-TIP means in order to receive preferential duty treatment provided under the trade agreement, fabrics used in apparel production in general need to be sourced either from the US or EU, but yarns used in textile production can be sourced from anywhere in the world. Exploring data at the 4-digit NAICS code level can find that the United States remains a leading yarn producer. 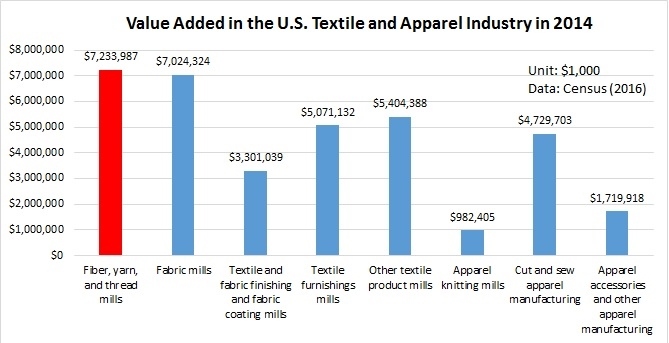 Value of U.S. yarn production (NAICS 3131) even exceeded fabric production (NAICS 3132) in 2014. This means: 1) U.S. has sufficient capacity of yarn production; 2) it will be in the financial interests of the U.S. textile industry to encourage more use of U.S.-made yarns in textile production in the T-TIP region (i.e. pushing the “yarn-forward” RoO). 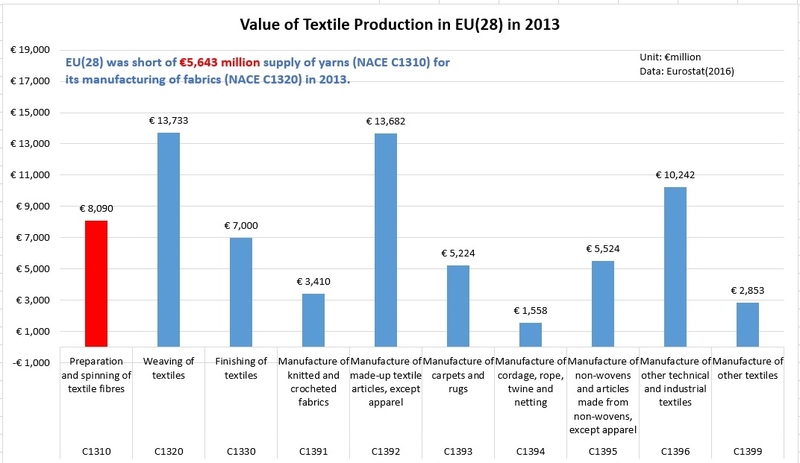 However, data at the 4-digit NACE R.2 code level suggests that EU(28) was short of €5,643 million local supply of yarns (NACE C1310) for its manufacturing of fabrics (NACE C1320) in 2013 (latest statistics available). This figure well matched with the value of €4,514 million yarns that EU (28) imported from outside the region that year. Among these yarn imports (SITC 651), over half came from China (22%), Turkey (19%) and India (13%), whereas only 5% came from the United States. Should the “yarn-forward” RoO is adopted in T-TIP, EU textile and apparel manufacturers may face a shortage of yarn supply or see an increase of their sourcing & production cost at least in the short run. Author Sheng LuPosted on April 25, 2016 April 19, 2017 Categories International Trade, Original Research, Sourcing, Textile industry, Trade policy, USATags international trade, rules of origin, Textile industry, trade policy, TTIP23 Comments on Why NCTO and Euratex Disagree on the Textile and Apparel Rules of Origin in T-TIP?